We are most grateful to widcombewest supporter Phil Bendall who compiled most of the following history from his wealth of local research material. 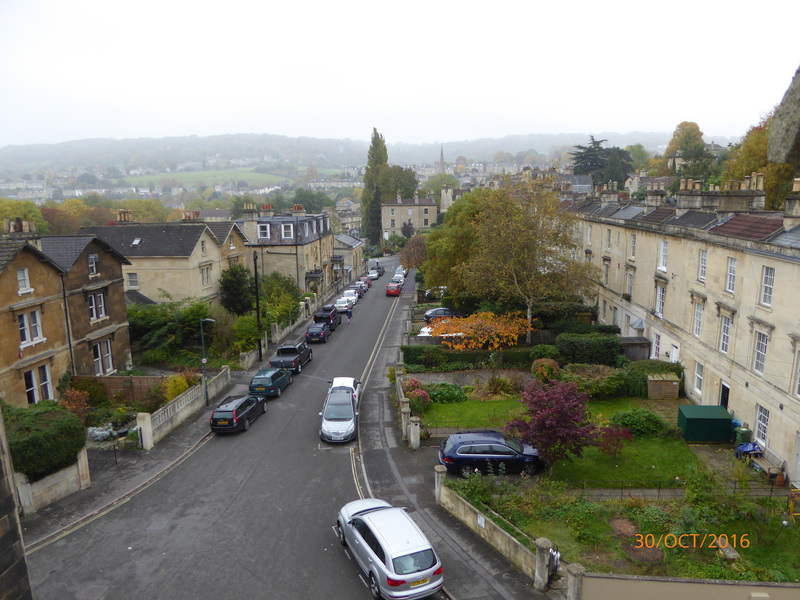 The land where St Mark’s Road was built was part of the area of Lyncombe & Widcombe that was granted by King Edgar to the Priory of Bath in AD 970. The Reformation led to the selling off of the land and, from then until the 19th century, the parcels of land below Beechen Cliff were undeveloped agricultural areas. Detail from Harcourt Masters’ map 1795. British Library public domain. Nearby there had been building of houses from the Old Bridge along Claverton Street. At the lower end of Lyncombe Hill (then Lyncombe Lane) was the site of the first of the parish’s poor houses – built in 1729 – and the house called ‘Pope’s Villa’ at 2 Lyncombe Hill, reputedly named as such because the poet Alexander Pope (1688-1744) stayed there. The buildings in St Mark’s Road comprise: St Mark’s Church (now a Community Centre), the terraced houses on the southern side, the villas on the northern side and the Temperance Hall. The land west of the current church was acquired by the parish in 1825, it included a mansion, formerly belonging to the von Luders family, and its garden. The garden was made into the parish’s third burial ground and the mansion into the parish’s new Poor House. In 1826 consideration was given to building a new church for the parish. The church of St Thomas à Becket could accommodate fewer than 100 people. When Ralph Allen developed his quarries, railway, riverside wharf and workers’ housing in Widcombe, he also had to have galleries built in the church for all these new parishioners. It took until 1830 to secure the money to build the new church and it wasn’t until 1832 that it was consecrated by the Bishop of Bath & Wells. 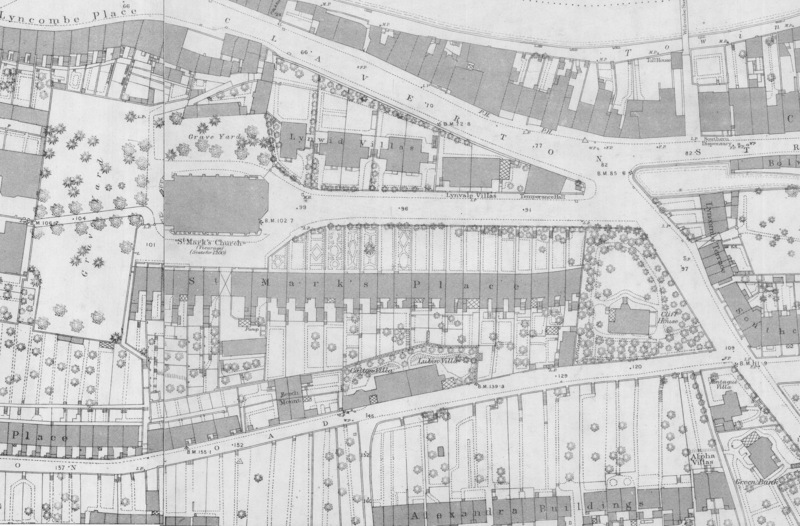 Detail of OS map of 1885 showing St Mark’s Road. Reproduced by kind permission of Bath Record Office. South aspect of St Mark’s Community Centre. Photo courtesy Phil Bendall. The church was designed in the Perpendicular Gothic Revival style by Bath City architect George Phillips Manners, who was responsible for designing many religious buildings in the area. Some of the finance came from ‘His Majesty’s Commissioners for the Building of Churches and Chapels’ which had been set up to compete with the rise of nonconformist places of worship. It was intended that there be 1,200 seats, although in practice only about 800 people could be accommodated. Access to the church was via steps from Claverton Street leading to the western door. The church was initially considered as a daughter church of St Thomas à Becket; it did not keep its own registers and wasn’t permitted to perform marriages. The rector was the Rector of Bath and the minister in charge was a curate. The parishes of Lyncombe and Widcombe were formally separated in 1856, St Mark’s becoming the parish church of Lyncombe. It was only at this point that the minister in charge was a vicar rather a curate and marriages were allowed to take place in the church. Of all the seats in the church, 630 were declared to be ‘free’. For the remainder, parishioners could pay a ‘pew rent’ and have their names painted on the end of the pew. The Ebenezer Chapel in Widcombe made a point of all their seating being free. In 1914 the then vicar wrote a letter to parishioners urging them to give up this practice of reserving places by paying a pew rent and to remove their names from the pews “and thus help efface this blot on the worship of God”. He suggested that “If anyone wants any particular seat it is only a question of getting to the church early”. In History of St Mark’s Church, Bath by Arthur George Cole (1910) the author addresses the issue that the church was built in the wrong place. At the time it was built, “the whole of the residential part of the parish of Lyncombe, lay in the immediate neighbourhood. All of that now densely populated district of Oldfield Park, Hayesfield Park, Bloomfield Gardens and Avenue, and the Beechen Cliff Avenues were all green fields …”. 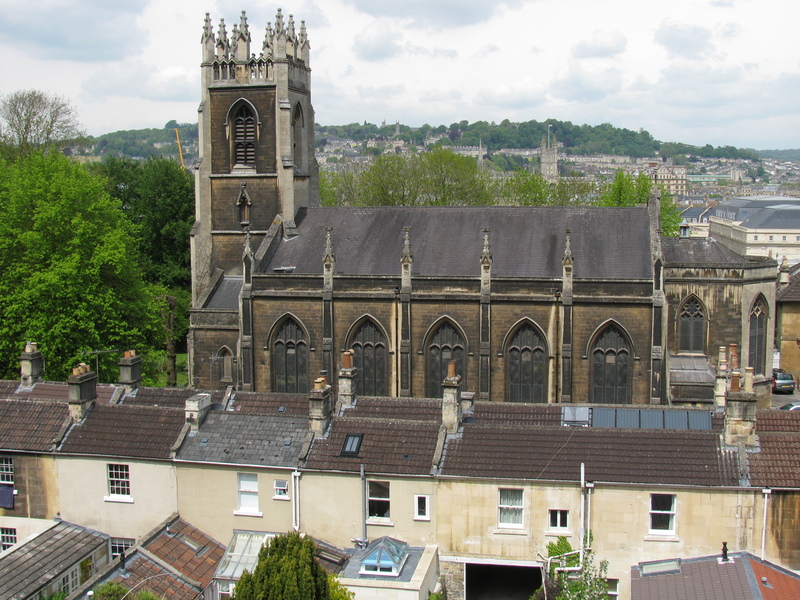 To accommodate the growing population other churches were built: St Matthew’s, Widcombe Hill (1847), St Luke’s, South Lyncombe (1867), Mission Church, Lower Bristol Road (1889) and St Bartholomew’s, West Lyncombe (1893, rebuilt 1938). The church was closed in 1970s and it now serves as a community centre, run by a dedicated group of volunteer trustees. The centre is well-used by a popular pre-school and other local groups using the main hall and the pleasant tree-lined garden; it also serves as the local polling station during elections. Two schools, opened in 1856, to the west of the church were associated with St Mark’s; both were closed in 1962. The mixed junior school was demolished to make way for Alton Place, but the infants’ school still stands. The surviving building was used by Bath Technical College and by artists; it is now the premises of a thriving architectural model studio. The land was owned in the 1700s by the Collibee family and in the early 1800s by Henry Mant who sold the land on which St Mark’s Church was built. In the 1830s and onwards the terraced houses were built progressively to end up with 18 three-storey houses and 8 two-storey houses. Over several decades the terrace was given names St Mark’s Buildings and St Mark’s Place West and East and eventually St Mark’s Road. In 1838 there were 4 houses, increasing to 12 by the 1841 census, five recorded in St Mark’s Buildings and seven in St Mark’s Place. By the time of the 1851 census there were 19 houses, nos. 1-17 St Mark’s Place plus two without numbers, comprising the two-storey houses at the eastern end and ten of the terrace of three-storey houses. Part of the Cotterell Map of 1852-4 showing the southern terrace and the western access to the church. Reproduced by kind permission of Bath Record Office. From the late 1850s to 1864, eight further three-storey houses were added at the eastern end. The 1861 census shows six houses listed as St Mark’s Place East and seventeen houses as St Mark’s Place West. The last house to be built was No. 26 in 1871. This half-sized house was added onto the western end of the terrace and was occupied for many years by a Mr Barter, gardener, and his family. An anomaly in the terrace is No. 20 that has two stable doors which lead to outbuildings, which have recently been converted into a dwelling. The house was originally occupied by Henry Stone, a well-sinker and quarry master. The early rate books show that the houses were owned by the main developer and the original owner of the land. In common with many properties built on the side of Beechen Cliff, they were freehold but subject to a ground rent. View of St Mark’s Road looking east. In 1870 there was proposal by the Somerset & Dorset Railway to put a railway line from Green Park Station through Oldfield Park and then into a tunnel under Beechen Cliff. In the end another route was chosen, otherwise St Mark’s Road would have been between two railway lines. The seven residences on the northern side of the road comprise: nos. 1 and 2 Lynvale Villas and nos. 1-5 Lynwid Villas. These were built by Henry Stone around 1870, the well-sinker and quarry master living in St Mark’s Road. Lynvale Villas originally had gabled roofs but by 1895 these had been converted into mansard roofs making them into four-storey houses. Some of the houses in Lynwid Villas were occupied by members of Henry Stone’s family. The Bath branch of the Temperance Society was founded in 1838 and operated from different locations until it was decided to build a permanent hall. The Rechabites were another group associated with the Temperance Society in Bath. The Independent Order of Rechabites was founded in 1835 and was so-named after the biblical descendants of Rechab who refused to drink wine or live in houses. The Rechabites also had death and sickness benefit societies. The hall on the corner of Lyncombe Hill and Claverton Street has the year 1847 prominently over the door; the foundation stone was laid on 5 April 1847. 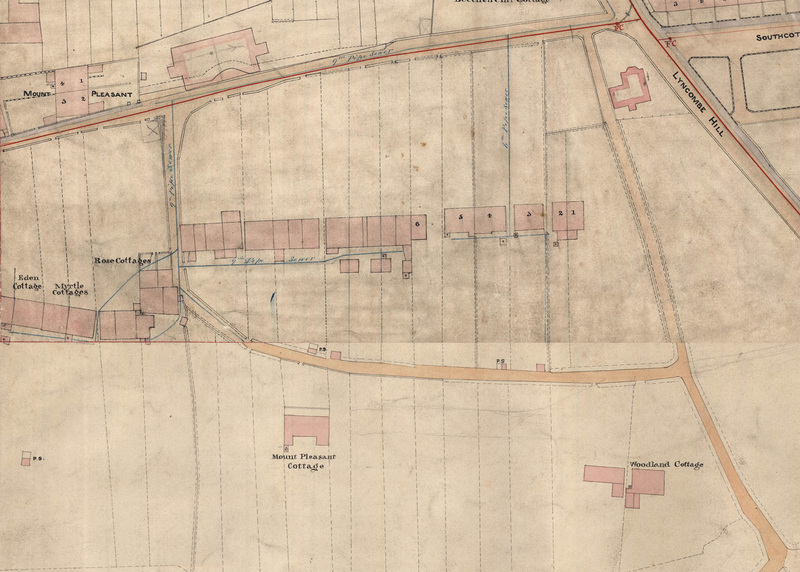 The plot of land had once been the site of a toll-house for the turnpike road which had disappeared by the 1830s. However the building did not remain as a Temperance Hall for long as the Bath Chronicle of 3 May 1849 reported: “On Sunday last, the building hitherto known as the Temperance Hall, in Widcombe, was opened for Divine Worship by the Wesleyan Methodists of this city, when three sermons were preached; … The congregations were large.” (The Methodists had, in the period 1834-1838, used Ebenezer Chapel in Widcombe, but had given it up due to the cost.) Despite the change of use, the name “Temperance Hall” persisted. Other than for religious purposes, the hall also served as a place for exhibitions, political club meetings and as a polling station. By 1895, the place was no longer in the list of Wesleyan places of worship. 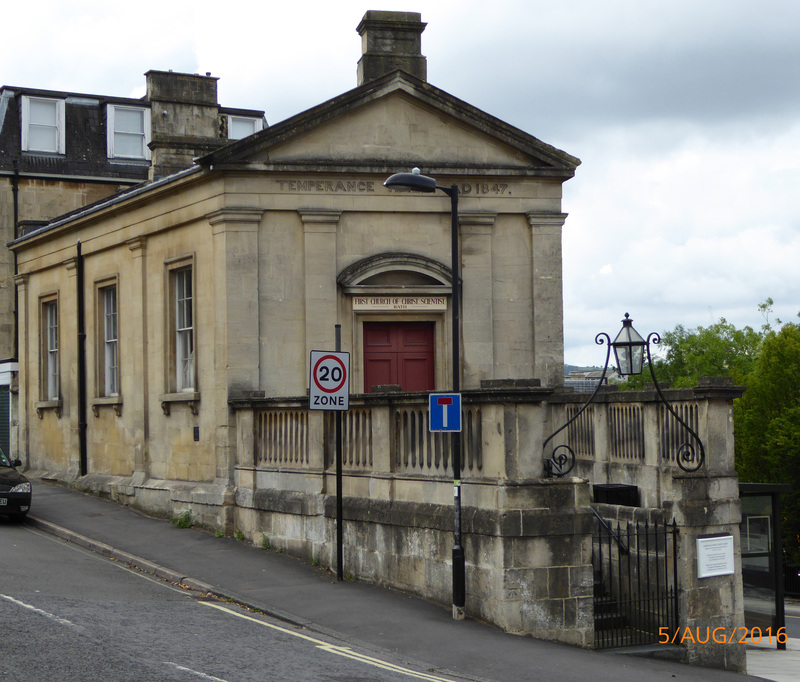 In 1904 the Bath Temperance Association, which still owned the building, applied for a music and dancing licence. There were a series of winter musical performances arranged by the association, these being accompanied by temperance addresses. In 1930 the hall was used by the Elim Foursquare Gospel Church for three weekday evening services. A notice in the Bath Chronicle of 3 June 1939 invited boys wishing to join the Air Defence Cadets to be at the Temperance Hall, Widcombe “to be medically examined and fill in enrolment forms”. In 1945 the hall was acquired by a group of Wesleyan Evangelists who redecorated it and re-named it “Calvary Hall”. It is now the First Church of Christ, Scientist. 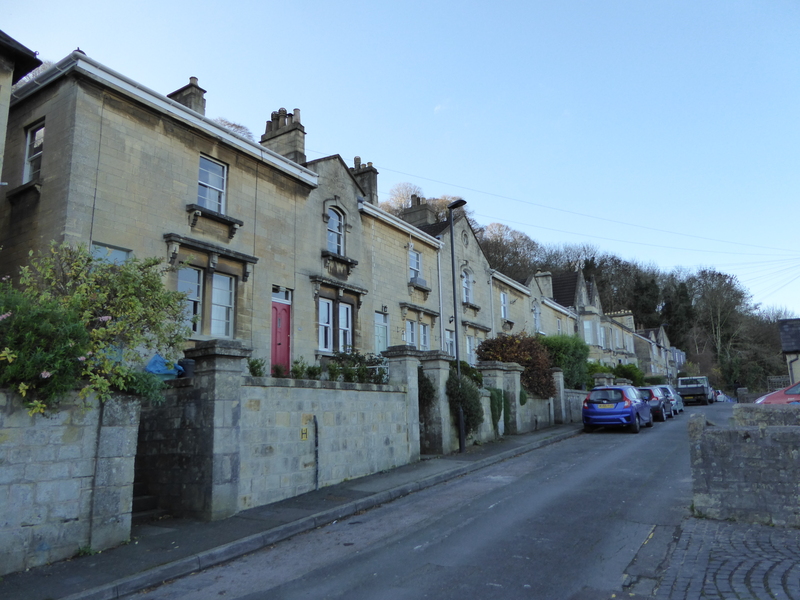 From their lofty position on the slope of Beechen Cliff, properties in Alexandra Road and the adjacent houses of Calton Road that share road access, enjoy splendid views over Bath city. 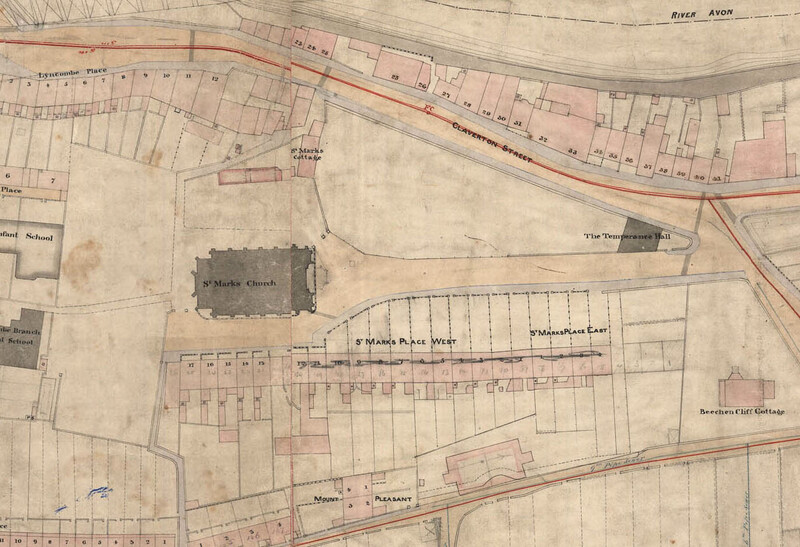 Development began in the early 1830s and Cotterell’s map shows that in the early 1850s properties in Calton Road were well-established, but what was to become Alexandra Road was simply a track off Calton Road serving the isolated Mount Pleasant and Woodland Cottages, then linking to the ancient path that leads to the top of Beechen Cliff. 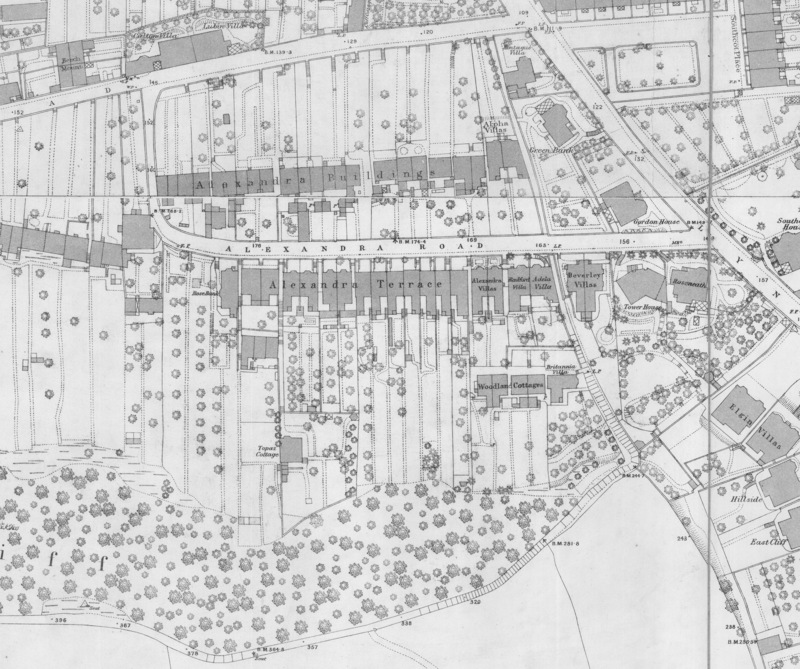 The road link to Lyncombe Hill was made during the 1860s, so that by 1871 the Census entry for Alexandra Road shows 33 plots for houses: 25 occupied, 6 built but unoccupied and 2 yet to be built; by 1885 the whole road was developed. Part of Cotterell’s map c. 1852. Reproduced by kind permission of Bath Record Office. Alexandra Road in 1885. Reproduced by kind permission of Bath Record Office. The imposing mid-Victorian terrace of 14-20 Alexandra Road. The only major changes to the buildings since 1885 has been the replacement of 10-21 Calton Road (shown as Alexandra Buildings) by houses built in the 1970s that are now numbered as 40-49 Alexandra Road, plus the building of three modern houses at the west end of the road. The ‘cottages’ high on the cliff above the villas, that are accessible only off the steep steps leading to Alexandra Park, are being renovated (Jan 2017). For those wanting to delve further into the past, a well-illustrated and wide-ranging ‘History of St Mark’s Road and Near Surroundings’ was compiled by Ann Wyatt in 1997 for the Widcombe and Lyncombe Local History Society. A detailed architectural description of St Mark’s Church (listed as Widcombe Community Centre) can be found on the Historic England website under List Entry Number: 1394877. A ‘History of St Mark’s Church, Bath’ by Arthur George Cole (1910) is available online at the Bath Record Office Burial Index website.